Muskmelon is a round melon with firm, orange and moderately sweet flesh loaded with numerous nutrients which qualifies it as a super fruit. This nutritious fruit will keep you hydrated on a long tiring day with its cooling effect. 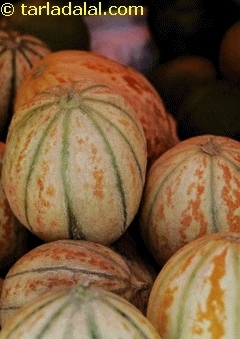 The glycemic index of muskmelon is 65 which categorizes this fruit as a medium glycemic index fruit. When matched with glycemic load (3.14) for a portion size of 150 gm (1 cup) it becomes totally safe for every lifestyle diseases. IS MUSKMELON SAFE FOR DIABETES? Muskmelon can certainly be safely added to a diabetic meal plan even if the glycemic index of muskmelon is 65. The reason is the low glycemic load of this fruit which is only 3.14. This is because about a cup of chopped muskmelon (150 grams) has approx. 5.7 grams of carbohydrates, thus allowing to raise the blood glucose levels slowly. Its high potassium content also helps in regulating blood pressure. IS MUSKMELON SUITABLE FOR WEIGHT LOSS? This melon also aids in weight loss because it is high in water content. Fat content in muskmelon is totally negligible making it a suitable fruit for managing weight. To relieve your hunger pangs you can dwell on this delicious fruit because it is also low in calories and its fiber content will help you feel satiated for longer period of time.